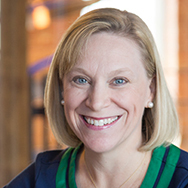 Duke Corporate Education>Our Story>Our People>Staff>Leah D. Houde, Ph.D.
brant community of professionals committed to doing innovative work for our clients. Prior to assuming the RMD role she was Duke CE’s Global Head of Human Resources, responsible for talent management, internal individual and culture development, and human capital planning. In addition to leading Duke CE’s flagship office in Durham, NC, Leah also works with clients in the design, development, administration, and delivery of educational experiences. As an executive director, Leah’s primary responsibility is to lead Duke CE’s largest and most strategic client relationships. At its foundation, she helps clients align their leadership development efforts in support of their broader business strategy. To do this, Leah’s various roles include consulting with clients broadly on their learning architectures or more narrowly on specific program designs; orchestrating, teaching and facilitating in program deliveries; and coaching executive participants through individual leadership and strategic business challenges. Most recently she has focused on developing executives by engaging them in the real work of systemically analyzing and crafting strategies to build critical organizational capabilities. She has also taught senior leaders coaching and development skills, leading change and self-insight. Additionally, Leah has coached participants in the distribution of 360° feedback and has also coordinated the development of a leadership feedback instrument. Focusing on how to engage people in strategy, Leah’s article Aligning Education with Business Strategies was published by CLO Magazine in its September 2005 edition. In her work with clients – including AT&T, SAIC, HP, QBE, Deutsche Bank, Eli Lilly & Co, Royal Dutch Shell, Ericsson, PwC and Siemens – Leah has focused on developing the capabilities needed to help overcome challenges facing managers as they transition into their new roles in organizations as well as helping members of large organizations at various levels think about how to lead and make a successful impact on the organization from their earliest experiences. While completing her doctoral studies in management at Duke’s Fuqua School of Business, Leah taught in the areas of organizational behavior and general management while working extensively with Executive Education Programs at Fuqua. Leah received her BS in Psychology and PhD in Organizational Behavior from Duke University. Her research interests involve groups and group behavior, as well as how individuals think about employment relationships and the risks and benefits associated with the structure of various employment forms. See her white paper on Duke CE’s website, co-authored with Justin Carlson, entitled “Partners of Choice: Building a Flexible Workforce Through Relationships” for an overview. During her Duke CE career, Leah spent six months in Duke CE’s London office working to develop new employees, grow the office’s culture and processes to align with those at the Durham parent location, and help to build the client base in the UK and Europe.